Making friends along the way, goodbye Australia! "With $37 in our pockets and much apprehension in our hearts, we flew toward our future. We had no time to think what lay ahead because the future conies to soon anyhow." 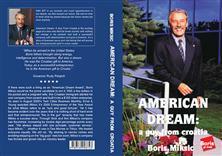 American Dream: A Guy From Croatia is the exciting saga of a man who fled his home country with nothing but change in his pockets and built a successful company with determination and guts in America. It's a story of business savvy and risk taking that will arouse the entrepreneurial spirit in every reader. "When he arrived in the United States, Boris Miksic brought along energy, intelligence and determination. But also a dream. He was the Croatian gift to America. Today, as a successful entrepreneur, he is the American gift to Croatia."